The outdoor classroom prototype I wish to design would be between a mid-cost and high-cost project. It would need to be built on enough land, at least 500 square feet, to support an active-learning outdoor environment/classroom. This means the school grounds must be large enough as to have a separate, defined space that could be designated as an outdoor classroom – somewhere students and staff may go to get away from the ‘brick and mortar’ of the school house. A crushed limestone pathway will lead students from the school building to the outdoor classroom; this material will allow rain to permeate and thus drain quickly and yet provide a more stable walking surface in all weather conditions (vs. a worn turf path which can become muddy over time). The outdoor classroom will consist of a half-circle shape of two sets of brick/grass area for students to sit and lounge if desired. Also, the center of this half-circle will include a brick area for a teacher to stand (or sit) to discuss the learning material with the class. Also, this setting will be within a slightly forested area, as to provide for consistent shade. 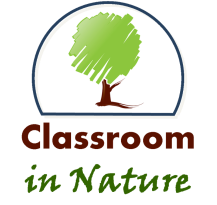 It would also be beneficial to have a nature trail that starts in the outdoor classroom, and loops back around to another area of the outdoor classroom, as to provide for discovery and engagement. This trail should be at least one-quarter mile long. Additional ecosystems experiences along the trail would be preferred – like a field and/or a shallow pond, where students may experience nature in its fullest. As described above, there are many different possible designs for an outdoor classroom. A school district or community does not need to follow exactly the prototype design elements described in this paper. In fact, I hope school districts and communities take what they will have learned from this paper about outdoor classroom design elements and alter them to fit their specific needs, abilities, and desires as a school district or community. This means if a school district has minimal budgetary allowances, maybe it should use picnic table benches for student seating. Or, if the school grounds do not allow for a nature trail, it should not be included, or perhaps shortened to be able to be incorporated. Although, if there is money allowances and an area for such a nature trail, or flower/vegetable garden, then the school and community leaders should seriously consider adding such features because the richer the environmental elements, the greater the opportunities for learning, and for providing a sense of being ‘away’ from daily routines.